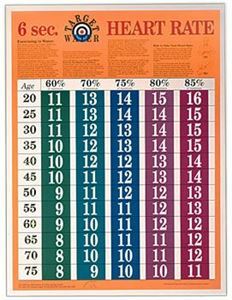 An attractive four color 19" x 25" poster designed for aquatic and fitness facilities on the proper use of heart rate in determining exercise intensity while exercising in water. It contains information on determining maximum and training heart rate, 6 sec. heart rate conversion table, water training heart rate target zone guide (60-85% of Maximum Heart Rate as determined in the water for ages 20-75) and information on designing a safe and effective workout session in the pool. Posters cannot be shipped USPS Priority Flat Rate Envelope for $7.35; please choose only UPS or USPS Priority package shipping options (or USPS First Class Mail if ordering one paper 6 Sec.THR Chart for Aquatic Exercise poster). Also available as paper 6 Second Target Heart Rate poster and in Stretching Pad and individual laminated pad sheet formats.